It can be said with tremendous confidence that the Lambda Cold Dark Matter (LCDM) model of the universe is doing a fantastic job so far as THE model of the universe that explains most of its phenomena – the cosmic microwave background, the formation and evolution of objects in the universe, cosmic accelerated expansion, the evolution of various particle species, and even gravitational waves! Both simulations and observations that incorporate LCDM to make predictions have been consistent with each other. That being said, there are a few areas in the field of astrophysics where LCDM is falling a little short of convincing; this is a cause for worry. Structure formation has been an exciting field for the past few decades, keeping astrophysicists busy with the mysteries of how objects like galaxies and galaxy clusters evolve from the primordial perturbations in the universe. Simulations of large-scale structure from the early universe to now (e.g. Bolshoi, Millenium, Illustris), and large sky surveys that observe billions of objects (e.g. SDSS, DES), indicate the presence of massive dark matter halos whose gravitational potential wells attract matter to form galaxies and eventually galaxy clusters. Moreover, natural product of this is the presence of low mass and low brightness dwarf galaxies on the peripheries of larger galaxies, known as satellites. These are galaxies that are influenced by the gravitational potential of their host galaxies, but are stable astrophysical entities in themselves. The above described paradigm and its products are the centerpiece of an ongoing debate (one of the major LCDM issues), called the ‘Missing Satellites Problem’. Figure 1. 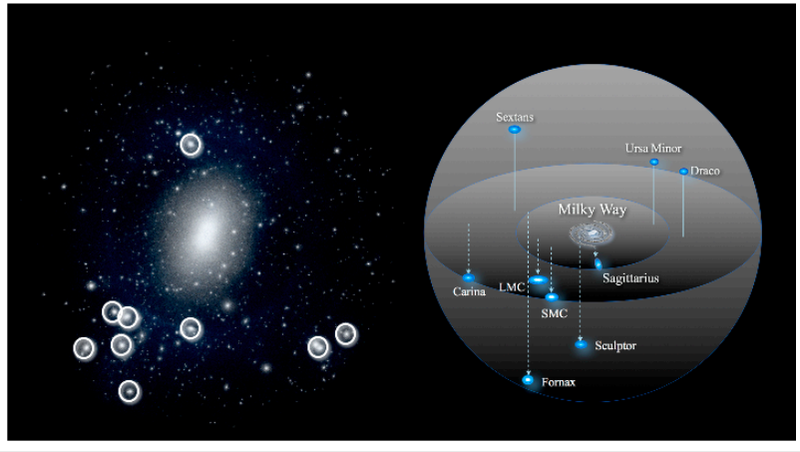 Dwarf/Satellite galaxies seen in (left) a simulation with a Milky Way sized halo, and (right) observations of the Milky Way from sky surveys. The circles on the left are the highest mass satellite halos seen in simulations, and there are far too many similar-sized halos in the simulation than in observations. 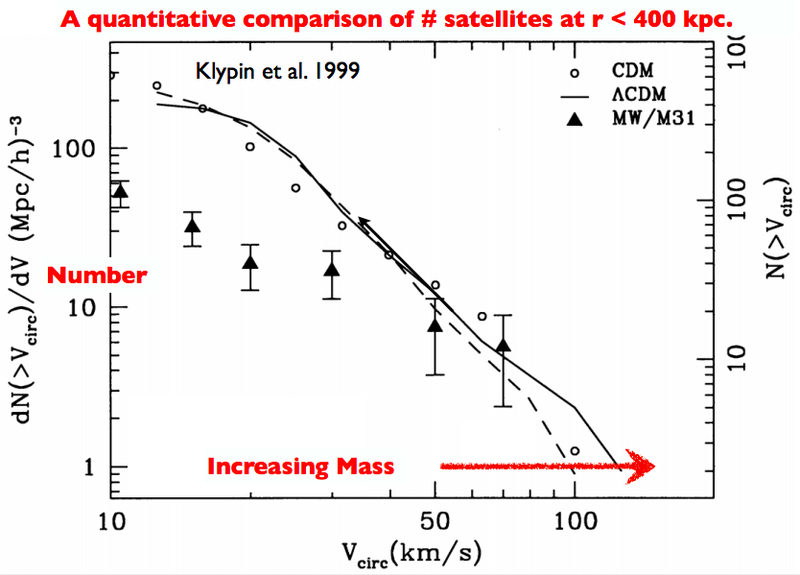 This is the MSP (Image on left: From simulations described in Garrison-Kimmel et al. 2014a). The ‘Missing Satellites Problem’ (MSP) is the discrepancy between the number of satellite galaxies seen when a Milky-Way type galaxy is simulated, and the dwarf galaxies observed around our own Milky Way – we aren’t seeing enough satellites around us (See this and this astrobite too!). A Milky Way type galaxy is made of 1010.5 Msolar worth of stars, 1011 Msolar worth of gas, and 1011.5 Msolar worth of a dark matter halo that contain the Milky Way and its satellite dwarf galaxies. While we are still in the process of discovering faint dwarf galaxies, astrophysicists wonder if there are indeed enough satellites to confirm simulation predictions. This is an example of the MSP, which has also now been seen in nearby isolated but large galaxies, is shown in Figure 1 and Figure 2. Figure 2. Number of satellite galaxies vs circular velocity (or mass) in simulations (solid line) and observations (triangles with error bars). Below ~50 km/s, a discrepancy can be seen between simulations predictions and observations (From Klypin et al. 1999). One of the most popular solutions to the MSP is that the smaller dark matter halos that host dwarf galaxies do not have detectable stars or gas (These smaller halos are called ‘subhalos’, around masses of 106-108 Msolar, with the main halo being that of the host galaxy). The halos are either not massive enough to gravitationally attract cold gas to form stars, and/or there are physical phenomena undergoing within these subhalos that prevent the formation of luminous stars, preventing us from detecting these dwarf galaxies. A comprehensive understanding of how stars form in low-mass galaxies is key to figuring the MSP out. One of the main reasons why gas doesn’t turn to stars is feedback that keeps cold gas from forming stars – this could be caused by ionizing photons that heat up colder gas, supernovae explosions that eject colder gas outside the galaxy, stellar winds, etc. Several models in simulations are making headway in correcting their predictions after taking these phenomena into account. Moreover, a better understanding of the sensitivity of telescopes that observe these dwarf galaxies can help bridge this gap between the two galaxy counts too! Is today’s paper the solution? This paper attempts to demonstrates that once the above described effects are taken into account, MSP ceases to exist. This work looks to correct observations from SDSS, which only observed ~2% of the local volume of the Milky Way and its dark matter halo, assuming our galaxy’s dark matter halo is a sphere. The authors compare the observed dwarf galaxy count (after correcting SDSS observations for this volume factor), with the satellite count in simulations above a luminosity threshold/floor (since only brighter dwarf galaxies would ever be observed by today’s ground based telescopes). Moreover, the analytical models provided in this work that perform this volume correction and a correction for the lower limit of detectability in surveys go on to predict the ‘luminous’ satellite galaxy count near the Milky Way. These models imply a dependence of satellite galaxy count based on distance from the Milky Way dark matter halo center (Eq 6 in the paper). This relationship is also tested for different halo profile shapes (like NFW) and different physical phenomena (like tidal stripping). The authors then use this radial distribution to correct the ‘observed’ galaxies in SDSS. This luminosity and volume-based ‘completeness correction’ matches predictions from cold dark matter simulations. Hence, MSP is deemed solved. Figure 3. 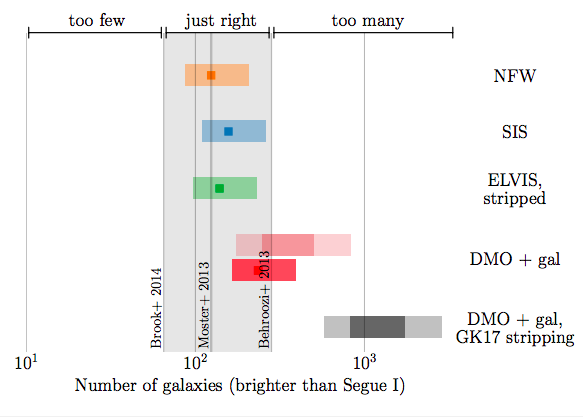 This figure (from today’s paper) displays the number of halos brighter than the dwarf galaxy Segue 1, expected from various dark matter halo density profiles that may or may not incorporate other physical phenomena (five of them are listed here, with colored bars). The grey band is region describing the expected number of observed halos, after the ‘completeness correction’ is implemented according to this paper. To reiterate, the novel aspects of this work are the volume and luminosity-based corrections. The authors also explore various dark matter models and galaxy formation models to test their predictions from analytical and corrected observed galaxy counts. Although these predictions do not vastly separate independent models based on various dwarf galaxy profiles or dark matter models (concepts that are not well understood in dwarf galaxy astrophysics), future surveys that will be sensitive to low luminosity galaxies around the Milky Way will surely improve our observational understanding in this field. Grad student at UChicago. I look at the fantastic phenomenon engulfing galaxy clusters that is gravitational lensing. If that sounds cheesy and/or weird, wait till you hear me talk about science, chocolate chip muffins and comic books. The Milky Way – Tearing Apart Friendships for Billions of Years Counting the Dwarf Galaxies of the Milky Way Snake (on a Plane) in the Clouds Satellites of satellites should exist. Let’s go look for them.